In 1995 was in de grote tentoonstellingszaal van het NAi de installatie DE GOLEM van Urit Luden te zien. Gelijktijdig verscheen DE BOEX in een gelimiteerde uitgave van 150 exemplaren. Deze ‘tentoonstellingscatalogus’ is echter geen schaalmodel van De GOLEM maar een simulatie van de ervaring. Omdat deze ervaring slechts voor een klein aantal mensen is weggelegd, heeft Urit Luden een vervolg gemaakt: Black BOOX. Binnenkort te zien in de TU Eindhoven. THE GOLEM, according to an old Jewish legend, is a clay figure supernaturally brought to life. An artificial creation of life by man. THE GOLEM was never alone. Many cultures throughout history had their own artificial man. Yet, among his fellows, THE GOLEM was the only one to let us participate in the process that brought him to life. The ritual of making Golems involves the combination of letters, which form a language, which expresses ideas. THE GOLEM is generated by the abiltity to transform words into form. Architecture, Luden believes, is a Golem. An abstract idea, theoretical questions, formed into shape. The ritual is not the illustration of words with form, but a way of working them out, using magic. A BOOX is a combination of a book and a box, a construction-set and a board game. It deals with the different languages used by the architects to think and communicate a work of architecture. A BOOX, as all architectural representations, plays the confusing double role of being an autonomous object, telling its own story, and at the same time being the representative of THE GOLEM installation. Black Boox is a spectacle of light, lines, stories and space. Black Boox is a self reflection (in public) of A BOOX on its own contents. A BOOX is a book folded as a box. A BOOX contains lines, punch-cards, memory data, magic stones, characters, story-boards, drawings, text and colors. As the 3D box flattens, the 2D+1D elements starts building up the space and moving around in an endless journey. The story is dictated by the dices, and the readers will and imagination. 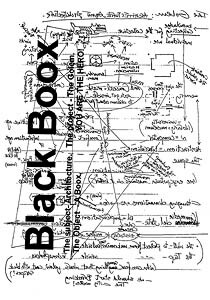 Black Boox is a playful discussion on the representation of Architecture in general and about books on architecture in particular. A BOOX (published by NAi publishers 1995 in a limited edition of 150) was made for an intimate reading. NOW, A BOOX GOES PUBLIC! Black Boox is an exhibition where A BOOX reveals its references, reinterpretes its own stories and re-presents its ideas and memories. Black Boox goes public from August 28th until September 30th at the library of the architecture faculty, University of Technology, Eindhoven.